Nothing in life can quite measure up to a good night’s sleep. Most of us take our Z’s for granted until we find ourselves tossing and turning one fine evening. Or waking up after sleeping only a few hours. All it takes is one or two sleepless nights to make you appreciate a good night’s rest! Studies show that stress and anxiety make up for at least half of all sleeping issues. You can significantly lower stress and feelings of anxiety by relaxing with nature. Not many of us have the luxury of being able to sleep with the windows open and enjoy the sounds and smells of nature, but you can do the next best thing; bring nature inside! Plants have a calming effect on the body, so why not add some plants that a NASA study showed purified the air and helped to induce sleep? We are going to tell you which 5 plants were tops on this list so you can add a few to your bedroom this weekend and breathe a bit easier! Also known as Mother-in-Law’s Tongue, this plant not only improves the air quality of the room, but it needs very little light and even less water. Snake plants are terrific at filtering out common household toxins in the air (such as benzene and formaldehyde) while emitting pure oxygen at night. This means that by putting a pot of snake plant in your bedroom, you can clean the air and get plenty of pure oxygen in one fell swoop. Although you might have one of these in your kitchen window to help heal minor burns, you should really have one of these in your bedroom as well. NASA lists this simple plant as one of the best air-improving plants ever. 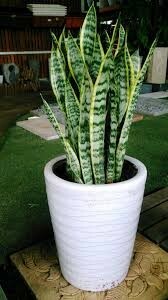 Like snake plants, this one also puts out pure oxygen at night to help you sleep better and it’s super easy to grow. 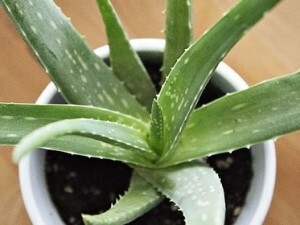 Aloe Vera needs sunlight, so be sure to find it a spot by a window so it gets as much sun as possible. Water it every two or three weeks, and that’s it! One of the great things about aloe vera is that they grow little babies off to one side pretty easily. Pick them off, place in a pretty pot, and use as the perfect gift for anyone who breathes! Don’t confuse this one with snake plants. Spider plants are usually found in hanging baskets because they send out little “spiders”, which are actually smaller versions of themselves. Pick off the little plants and you can start new ones. This light green plant with white stripes down the center removes about 90 percent of formaldehyde in the air, which is known to cause cancer. Formaldehyde is common in houses because it is used in grout and glues. 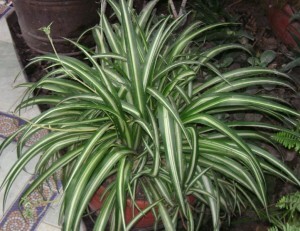 Spider plants absorb odors as well, so you might want to hang one in the bedroom and one in the bathroom! Peace Lilies are one of the most popular houseplants around because their creamy white “flowers” last for weeks at a time! This is another plant that also needs very little care. Bright light but no direct sun and watering once a week is all this little beauty needs! Peace Lilies are another one of NASA’s star plants, removing formaldehyde, benzene, and trichloroethylene from the air while improving humidity levels. The flowers alone can increase humidity by 5 percent! 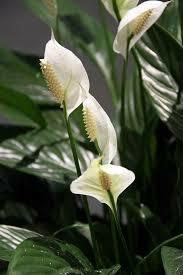 This plant also removes those little airborne microbes which cause sneezing and allergic reactions. Keep this one out of the reach of pets and children, however! 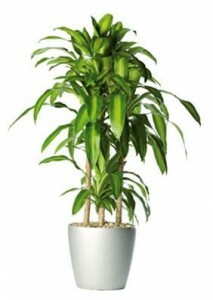 This plant goes by many names including Corn Plant, Dracaena, and sometimes Dracaenia, but you will recognize one the minute you see it. Chances are you have seen these super air purifiers everywhere; doctors waiting rooms, dental offices, lawyer’s offices, you name it! 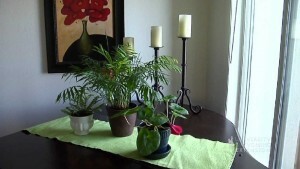 These plants are super easy to care for, need only bright light, and some water once or twice a week. Keep this one away from the sun as it will burn the leaves! Janet Craig is perhaps the superstar on NASA’s list of housecleaning plants, removing more chemicals from the air than just about any other plant. This one is so outstanding at cleaning the air that you might want to put one in every room of the house! Of course, we didn’t put all the plants on NASA’s list here as some of them are not very practical for indoor use, however, every single one of the plants on this list are terrific at cleaning the air and can help you to sleep easier just by having them around.